Several months ago, K threw me a birthday party on a beach in Carmel By The Sea and decided to make what I’ve always wanted to try – a clam bake! Before going to your cooking location, clean the potatoes, corn, clams and shrimp. To clean the potatoes, gently scrub them using a scouring pad under cold water. If they are large potatoes, cut them into 2 inch cubes so that everything will cook evenly. Corn needs to be taken out of the husk and cut into 2s or 3s. To remove the sand out of the clams, take the tightly sealed clams and soak them in water for about 20 minutes. I used frozen shrimp that was already de-veined and pre-cleaned; but if you bought fresh shrimp, make sure you take out the vein and rinse them in cold water before cooking. From here, you are ready to pack up your food and drive to your cooking destination. Pack the clams and shrimp seperately in a breathable container so that the seafood doesn’t go bad. When you arrive at your cooking destination, set up the grill and a table for preparation then slice the sausage into half-inch slices. Once the food is ready, you will need to layer your ingredients in the aluminum tray. Starting from the bottom, line up the sausages, potatoes and corn. Sprinkle about 2 tablespoons of Bay Seasoning and pour water or beer on top until there is about an inch of liquid in the tray. Cover the tray with foil and place it on the grill for about 30-40 minutes. Keep adding water or beer if needed, depending on the temperature of your grill. After about 30 minutes or after the potatoes have become fork tender, toss in the clams and shrimp and put the foil back on the tray. The clams and shrimp should take around 2-3 minutes to cook. Make sure you keep an eye on it at this point as the shrimp and clams can get leathery if overcooked. Once the clams are open and the shrimp are pink, you are ready to serve! Enjoy! 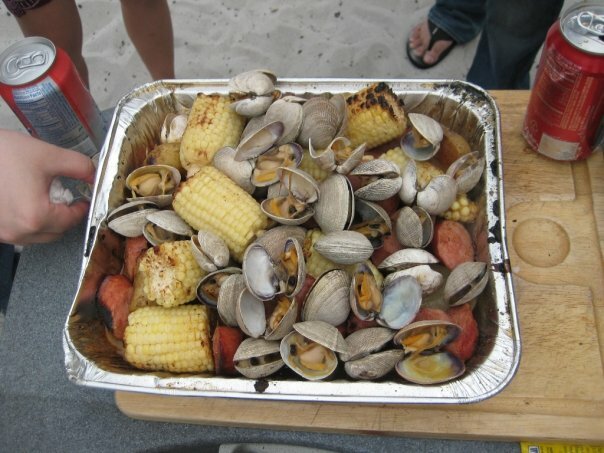 we’ve tried this clambake at home. It’s great! I dont see shrimp listed in the ingredients list. How many pounds did you use?